Almost eight years ago, in a hospital in Russia, a woman in her mid-twenties gave birth to her second baby girl. She already had one daughter, and she and her husband were excited to welcome another child to the family. Except immediately after she delivered her sweet, tiny beauty, the whispers started. 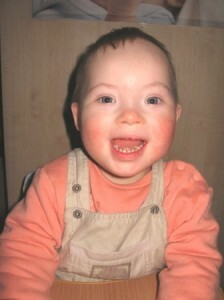 Her beautiful girl was born with Down syndrome, and this diagnosis would alter the course of their lives forever. During her post-partum hospital stay, the “specialists” came to talk to her. 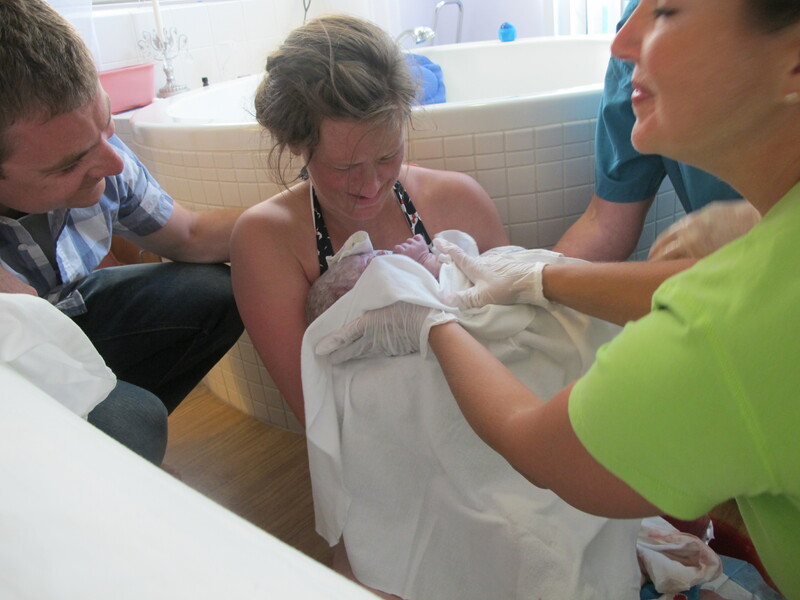 She was confused, and afraid, and just desperately wanted to hold her baby. Hear us out first, they forcefully asked. It’s not worth it, they told her, to get attached to this kind of baby. She will be nothing but a burden for the rest of her life. She will never be allowed or capable of attending school, so you’ll have to quit work and will never be able to find another job. Moreover, your poor older daughter will be an outcast, shunned by her friends and never invited for sleepovers. Your husband will invariably grow tired of the child and leave the family, and you’ll have to fend for yourself and your children. To make matters worse, children with Down syndrome become aggressive as they get older, and end up with monstrous strength that could be a danger to your entire family. It’s better to leave her now anyway, because she will never be able to form a connection with you – she won’t be able to give or receive love, and she’ll never understand that she has a mother anyway. She won’t have enough intelligence to even feel sad in an institution. This is really the best choice for everyone. They whispered the first of these things to her while she was still on the delivery table, crushing her joy and extinguishing her strength. Then, throughout the next few days, different experts all came around to reiterate the same message – I’m sorry for your loss but your baby simply isn’t fit for society. Please go home and do your best to forget about her. And this sweet young mama, this mama who was shocked and scared, confused, grief-stricken and numb, she did what they told her. She went home and tried to move on with her life. Because what other option was there? But she never forgot. She and her husband got pregnant again, and this time gave birth to a healthy baby boy. But life, it’s unpredictable, and their little man got sick. He was fighting cancer and eventually became too sick to go to school. (He is now in remission). She had to quit work to care for him, and the strain was too much on her marriage. She took a hard look at her life one day and realized, I’m am in the exact situation they described — I have no job, no husband, and a sick child who can’t attend school. The thing is, life can be unkind no matter how hard we try to protect ourselves, to insulate ourselves and our family from hardship and pain. And she determined, in that moment, that she would get her daughter back. Whatever the cost. She met resistance every step of the way. Searching through every possible database of children available for adoption, she finally saw a picture of a little girl she knew was hers. And she ignored protocol and called the orphanage in tears, begging to come see her daughter. They hung up on her. But she persevered, and obtained all necessary legal documents to reclaim the child she was persuaded to give up. Seven and a half years after she was born, her sweet girl finally felt the soft touch of her mama’s hands stroking her hair. She felt the cool tickle of her mama’s lips on her cheek as she whispered I love you. Yet even as her mother picked her up from the orphanage to take her home forever, they tried to convince her it was a mistake. She belongs “behind the fence” they told her, not out among the people. They virtually demanded she leave her child at the institution. But this mama, she wasn’t going to be persuaded twice. This time, she knew her daughter was worth fighting for. 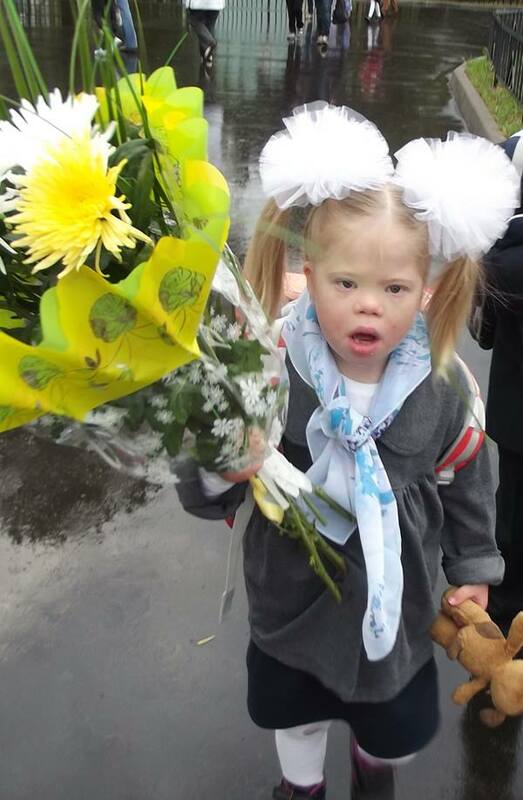 It wasn’t an easy transition, but she finally connected with an organization called Downside Up, a non-profit that provides support and advice for families raising children with Down syndrome in Russia. They also operate an Early Learning Center in Moscow, and develop innovative child training and parent support methods, as well as disseminating knowledge and experience among Russian professionals. But in Russia, where old prejudices and misconceptions about the nature of Down syndrome (and potential of people with Down syndrome) are still prevalent, sometimes a family’s biggest obstacle is others’ unfriendliness and lack of understanding. To that end, Downside Up works towards raising public awareness in hopes of changing societal attitudes. Today, this almost 8-yr-old attends a special school, and is thriving in her family. She is home, and free to grow at her own pace and in her own way with a mama who loves her madly. She is lucky to have a mama who is stubborn, unwilling to give up on her girl. But she represents so many more little boys and girls in Eastern Europe, who are relinquished to an orphanage because their parents are told it’s the only reasonable choice. This is a real story, about a real mother and her daughter. You can link to the Russian version here, as well as the Google translated piece here. I added emotions and feelings as I imagined they would occur, but the truth is intact. I imagined these feelings because I often imagine Boo’s birth mother, agonizing over the little boy she felt kick in her womb and saw laugh in her dreams. I brought Bug into this world only 15 days after she delivered Boo, and I know she loved him as fiercely in that moment he took his first breath as I loved Bug. It is such a beautiful moment. Then someone took a sledgehammer to her moment, and it shattered into a million pieces. I don’t feel angry when I think about his first mama, I feel compassion. Bucketfuls. And heartache. The same day I held our tiny bundle in my arms and cried tears of joy at his very existence, she mostly likely cried alone in a nursery prepared for a boy who never came home. Oh, Boo’s beautiful birth mama out there somewhere – I wish you could know … I promise you I will love him with all of my heart for the rest of my life. We will do everything in our power to make sure he always has what he needs to grow and learn and succeed. He will be cherished, but also challenged. We will always celebrate how lucky we are to have him, and he is finally going to make it home.